For Galway to fulfil its potential and become a counterbalance to Dublin and the greater Leinster area, some key issues need to be addressed. In order to stop the short-termism and firefighting that we have had in place of proper infrastructural development, we must start planning now. Several issues I have been working on will serve to illustrate my point. Being a medieval city of its size, Galway has a difficult history in managing its traffic problems. In that light, last March I arranged a meeting with Simon Coveney, the then minister for housing and local government, with business leaders in Galway, including Galway Chamber of Commerce. Consequently, a delivery team was established to progress transport and infrastructure across Galway. In relation to Parkmore, short term measures have been put in place and the city council is now working on medium term measures. However, the pace of progress has been too slow and I am currently working with officials in the Department of Local Government to have a specialist project manager appointed who will coordinate all the national bodies involved. The survival of the city and county is dependent on mobility. Up to 9,000 people travel to various Galway business parks every day from south Mayo, east Galway, and north Clare. While the construction of the ring road is warranted, it could take up to 10 years before it is constructed. It will also not solve the problems for people who will continue to travel in and out of the city. All solutions tend towards moving car A to point B with little or no thought given to taking traffic off our roads. Of course, we need better roads to facilitate the flow of cars but we need to move to a more sustainable model of transport in Galway. We urgently need park-and-ride facilities in strategic locations to the west, east, and north of the city. These must be positioned on bus routes with buses that run every 10 to 12 minutes at peak times and bus corridors created if not already in existence. In addition to an integrated public transport system, we must also invest in appropriate cycle lanes. More frequent commuter-train services between Oranmore, Athenry, and the city are required. There is a significant demand for more frequent usage from Oranmore into the city. Galway Clinic), is of vital importance. This 405 acre site has capacity for 2,700 homes and is designated as a major urban housing delivery site, a fast-track building scheme under the Rebuilding Ireland initiative. Given the shared ownership between Galway city and county councils it is vital that they work collaboratively to ensure the speedy completion of this project. I have been leading the campaign for a new acute hospital to be built at Merlin Park since my election to the Dáil in February 2016. 196 senior clinicians in University Hospital Galway have supported my campaign for a new acute hospital in Merlin Park. I am glad to report that the Minister for Health, Simon Harris, has agreed to a request from the group clinical director, Dr Pat Nash, for an options appraisal to be undertaken. This appraisal is due to be completed within the next six months. I fully support the construction of a new ED at University Hospital. This project is now at design stage. However, it will only be an interim measure and will not deal with our capacity issues, now and into the future. resulted in the investment of €65 million for services in communities. We need to continue this investment in primary and community care. While we enjoyed a successful tourism season again this year, due to this Government’s retention of the nine per cent VAT rate and the success of the Wild Atlantic Way, there is much more that can be done to make our tourism product more attractive. 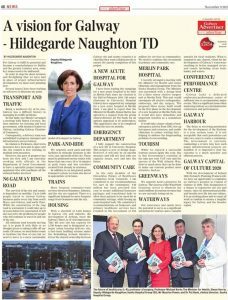 We urgently need a greenway for Galway. The success of the Waterford Greenway serves to illustrate the multi-millions in tourism revenue that we are currently losing out on. Our waterways and canals have the potential to serve as a significant attraction for tourists and a valuable amenity for local residents. What is required is one, shared, vision for the development of Galway’s waterways resulting in better managed rivers and canals including clean beds, banks, and waters. Galway lacks a dedicated multi-fuctional conference / music and arts performance centre, to accommodate major events. This could be incorporated with a music school. This is a significant issue when marketing Galway as a destination for conferences and performances. on Galway’s position as Capital of Culture in 2020. This designation is a chance to regenerate our city and county, raise its international profile, and breathe new life into our culture. It is an exciting phase and we must all work in tandem to ensure a tangible legacy for Galway and the broader region.